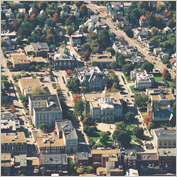 Learn more about Concord, New Hampshire using the City Guide below. Plan a trip, find local shopping centers, or just discover what makes Concord, New Hampshire so great! Concord is the capital city of New Hampshire, a state in New England. Take Interstate 93 from the south. Concord Trailways, 30 Stickney Av., Toll free: +1 800-639-3317. Service from Boston. Manchester - Boston Regional Airport, Brown Av., Manchester, Phone: +1 603 624-6556. International connections will be made through Logan International Airport in Boston. Concord Area Transit (CAT), Phone: +1 603 225-1989. Concord Cab Co., 1 Kennedy St., Phone: +1 603 225-4222. Main Street Taxi, 44 N Main St., Phone: +1 603 226-8888. Pittsfield Taxi, 14 Eastern Ave # 12, Phone: +1 603 435-7771. Christa McAuliffe Planetarium, 2 Institute Drive, Phone: +1 603 271-7827. Capital Center for the Arts, 44 South Main Street, Phone: +1 603 225-1111, Local theatre providing arts to the Concord area. If a big act comes to the New Hampshire area, most likely it'll be here. Beaver Meadow Golf Course, 1 Beaver Meadow Street, Phone: +1 603 225-7033 or Proshop: +1 603 228-8954, Fax: +1 603 224-2828. Concord Trail System (Hiking), 41 Green Street, Phone: 603-225-8515, Fax: 603-228-2701. Plausawa Valley Country Club, 42 Whittemore Road - Pembroke (just South of Concord on Route 3), Phone: +1 603 224-6267, Fax: +1 603 224-5297. Gibson's Bookstore, 27 South Main Street. Old, family-run bookstore -- great alternative to the big chains. Connected to a terrific German bakery. Moritomo Japanese Steak House and Sushi Bar, 32 Fort Eddy Rd., Phone: +1 603 224-8038. For good Sushi this is the place to go. Bread and Chocolate, 29 South Main Street. Great bakery goods, great sandwiches, terriffic bread. Small dine-in area. Connected to a good bookstore. Don Giovanni, 11 Depot Street, Phone: +1 603 226-4723. Makris Lobster and Steakhouse, 354 Sheep Davis Road (Rt. 106), Phone: +1 603 225-7665. Arizona Restaurant and Green Martini Lounge, 6 Pleasant St. Ext., Phone: +1 603 223-6672, Southwestern. Hermanos Cocina Mexicana (Mexican Kitchen), 11 Hills Ave, Phone: +1 603 224-5669, Great Mexican right behind Main Street. The Red Blazer Restaurant & Pub, 72 Manchester Street, Phone: +1 603 224-4101, Great food and atmosphere; Smoke free as of June 2006. White Mountain Gourmet Coffee, 15 Pleasant Street, Phone: +1 603 228-3317, Great Coffee shop right in front of Main Street (Behind Foodies Pizza). Best Western Concord Inn & Suites, 97 Hall Street, Phone: +1 603 228-4300, Toll-free: +1 800 528-1234, Fax: +1 603 228-4301. Courtyard Concord, 70 Constitution Avenue, Phone: +1 603 225-0303, Fax: +1 603 225-0606. Fairfield Inn Concord, 4 Gulf Street, Phone: +1 603 224-4011, Toll-free: +1 888 882-0042, Fax: +1 603 228-3353. Holiday Inn, 172 North Main Street, Phone: +1 603 224-9534. Comfort Inn, 71 Hall St., Phone: +1 603 226-4100. If you're visiting the Concord area, be sure to visit the Colby Hill Inn, in Henniker, New Hampshire. Great restaurant and wonderful, romantic guest rooms. Wine Spectator Award of Excellence, award winning candlelight dining. 17 miles West of Concord, 30 minutes N of Manchester, 90 minutes North of Boston. Travelling to or from Concord, New Hampshire? Find flight to or from Concord, New Hampshire with an Online Travel Agency. Get lodging information or make reservations with a Local Online Hotel. Plan ahead and reserve a car with a Local Car Rental Agency. Are you relocating to Concord, New Hampshire? Goods & Services in Concord, New Hampshire.